Bill Shankly, “I want Liverpool to conquer everybody.” – "Play Up, Liverpool"
Round about Saturday teatime the sharpest wit in football will be called upon to deliver a terse assessment of the Cup Final. Win or lose, Bill Shankly will have something to say. It might be brutal as acudgel, as swift as cyanide or just plain farce. But Shankly aged 57, the man whose words of wit and wisdom whistle around the country’s tap rooms, will have something to offer. His job? Manager of Liverpool, who meet Arsenal at Wembley on Saturday. 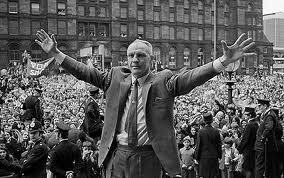 His drive, faith and passion have punched Liverpool into big-time football and kept them there for eleven years. And, in a city which reveres only two gods, wit and football, he is doubly worshipped. That’s only half a joke, really. Shankly, with his bristled bullet of a head and his face like a badly packed satchel, means it. It is this drive that earns him the name of a hard man and he expects the same degree of dedication from those around him. Shankly calls himself a man of the people. Certainly he enjoys the sort of adulation that only star players usually get. “I have lived amongst them. I know what they are like. They worship the team and I want to give them a team they can be proud of. “We have done well but even now I still think we can do better. They talk about these young lads breaking a few windows and so on, and say it’s football causes it. But it isn’t. And if hadn’t succeeded in football he would have liked to have been a boxing champion. “To look around like John. L. Sullivan and say I can lick anyone in the world. # On a hotel registration form Shankly entered his occupation as football and his address as Anfield. A friend pointed out they wanted to know where he lived. “That’s where I live,” he said.